We describe examination of fetal cardiac function with contemporary functional fetal echocardiography and fetoplacental Doppler ultrasound using the VisualSonics VEVO 2100 microultrasound in a surgically induced model of intrauterine fetal growth restriction in a rabbit. Hodges, R., Endo, M., La Gerche, A., Eixarch, E., DeKoninck, P., Ferferieva, V., D'hooge, J., Wallace, E. M., Deprest, J. Fetal Echocardiography and Pulsed-wave Doppler Ultrasound in a Rabbit Model of Intrauterine Growth Restriction. J. Vis. Exp. (76), e50392, doi:10.3791/50392 (2013). Fetal intrauterine growth restriction (IUGR) results in abnormal cardiac function that is apparent antenatally due to advances in fetoplacental Doppler ultrasound and fetal echocardiography. Increasingly, these imaging modalities are being employed clinically to examine cardiac function and assess wellbeing in utero, thereby guiding timing of birth decisions. Here, we used a rabbit model of IUGR that allows analysis of cardiac function in a clinically relevant way. Using isoflurane induced anesthesia, IUGR is surgically created at gestational age day 25 by performing a laparotomy, exposing the bicornuate uterus and then ligating 40-50% of uteroplacental vessels supplying each gestational sac in a single uterine horn. The other horn in the rabbit bicornuate uterus serves as internal control fetuses. Then, after recovery at gestational age day 30 (full term), the same rabbit undergoes examination of fetal cardiac function. Anesthesia is induced with ketamine and xylazine intramuscularly, then maintained by a continuous intravenous infusion of ketamine and xylazine to minimize iatrogenic effects on fetal cardiac function. A repeat laparotomy is performed to expose each gestational sac and a microultrasound examination (VisualSonics VEVO 2100) of fetal cardiac function is performed. Placental insufficiency is evident by a raised pulsatility index or an absent or reversed end diastolic flow of the umbilical artery Doppler waveform. The ductus venosus and middle cerebral artery Doppler is then examined. Fetal echocardiography is performed by recording B mode, M mode and flow velocity waveforms in lateral and apical views. Offline calculations determine standard M-mode cardiac variables, tricuspid and mitral annular plane systolic excursion, speckle tracking and strain analysis, modified myocardial performance index and vascular flow velocity waveforms of interest. This small animal model of IUGR therefore affords examination of in utero cardiac function that is consistent with current clinical practice and is therefore useful in a translational research setting. 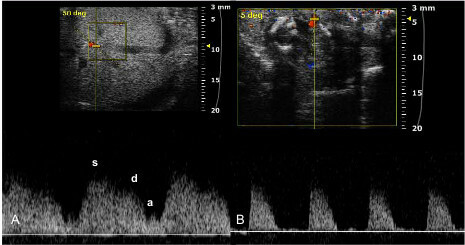 In this current methodological study, we used a well validated approach of selective uteroplacental vascular interruption in a rabbit13-16 that not only produces fetal cardiovascular responses observed with ultrasound clinically14, but also allows interrogation of fetal cardiac function with novel echocardiography using microultrasound technology of the VisualSonics VEVO 2100. While Doppler ultrasound of fetoplacental vessels remains the cornerstone of current antenatal surveillance of IUGR fetuses17, functional echocardiography is increasingly being utilized to provide new insights into disease pathophysiology and to assess fetal wellbeing.18 Accordingly, here we take these advances from clinical research and describe an animal model that harbors not only this imaging sophistication but also provides the experimental platform to investigate mechanistic pathways and novel therapeutics. The following experimental protocol is approved by the Animal Ethics Committee, Katholieke Universiteit Leuven, Leuven, Belgium. We followed previously described surgical procedure13 including some methodological changes, especially in anesthesia procedure. Time dated pregnant rabbits (hybrid Dendermonde and New Zealand White) are housed in individual cages on a 12/12 hr light schedule with access to water and standard rabbit chow ad libitum from gestational age (GA) 18 days. At GA 25 days (full term is 31 days approximately), rabbits are transferred to the operating theatre for surgical creation of IUGR. Prior to surgery, randomly allocate a "case" (IUGR) and "control" uterine horn in the bicornuate rabbit uterus by using randomization software (GraphPad Software, USA)19. Sample size should be determined by power calculations by individual researchers for their question of interest. Induction anesthesia is achieved by administering ketamine 35 mg/kg (Ceva Sante Animale, Brussels, Belgium) and xylazine 5 mg/kg (Ceva Sante Animale, Brussels, Belgium) intramuscularly in the hind leg. Anesthesia is then maintained with an inhalational mixture of 1-4% isoflurane (Isoba Vet; Abbott Laboratories Ltd., Queenborough, Kent, UK) in O2 at 2 L/min. Place a pulse oximeter (Nellcor N-20, Covidien, Ireland) on the maternal second and third toe to continuously monitor heart rate and arterial O2 saturation. Premedication. Prior to commencing surgery, administer antibiotic prophylaxis Penicillin G, 300,000 IU (Kela Pharma, Hoogstraten, Belgium), uterine tocolytic medroxyprogesterone acetate 0.9 mg/kg (Depo-Provera, Pharmacia Upjohn, Puurs, Belgium) and analgesic buprenorphine 0.03 mg/kg (Temgesic; Schering-Plough) subcutaneously in a single 2.5 ml syringe. Rabbit preparation. Place the rabbit on a warming pad for the duration of the surgery. Remove hair from the abdominal surgical field and apply antiseptic Povidone-iodine 7.5% (Betadine, Purdue, Connecticut, USA). A complete aseptic protocol is then employed. Abdominal laparotomy. Infiltrate the incision site with local anesthetic (2 ml 1% lidocaine, B Braun Medical, Belgium) subcutaneously. The incision site should be approximately 5 cm in length in the midline, in the lower 2/3 of the abdomen. Once the skin is opened, use a mixture of sharp and blunt dissection to expose the rectus sheath. Care must be taken to avoid the vascular maternal mammary glands located either side of the midline on entry (Figure 1A). Grasp the rectus sheath and peritoneum, tent to prevent inadvertent inclusion of abdominal contents, and carefully enter using sharp dissection (Figure 1B). Uterine exteriorization. Surround the surgical field with gauze drapes soaked in warmed saline. Carefully grasp and exteriorize both sides of the bicornuate uterus. Care must be taken not to place either the vaginal or ovarian end of each uterine horn under tension, as this may result in unwelcome bleeding, pain and uterine contractility. The assistant continuously irrigates the exposed uterus with warmed saline to prevent uterine contractions. Palpate and record the number of fetuses present in each horn. By convention, the fetus at the ovarian end is designated the first fetus. One uterine horn is the case horn and the other is the control horn. Identify the previously randomly allocated case horn for IUGR induction and then replace the control horn back into the abdomen (internal control fetuses). Surgically induced IUGR. Identify the uteroplacental vessels to each gestational sac in the designated case horn (Figure 1C). Surgically ligate 40-50% of these vessels using a 5-0 polyglactin suture (Ethicon Vicryl, Johnson and Johnson Medical, USA) (Figures 1D-1E). In practice, there are often three vascular bundles supplying each gestational sac. In this case, the largest vascular bundle is ligated. Once complete, the uterus is again irrigated with warmed saline and carefully returned to the abdomen. Abdominal closure. Close the abdomen in two layers using a continuous running 2-0 polyglactin suture (Ethicon Vicryl, Johnson and Johnson Medical, USA). Close the skin with subcuticular 3-0 polyglactin suture (Ethicon Vicryl, Johnson and Johnson Medical, USA). Spray aluminum aerosol onto the wound to prevent the rabbit from later interfering with the sutures. Recovery. Cease anesthesia and closely observe recovery of respiration. The rabbit is then housed as described above with access to food and water ad libitum and observed daily. The same rabbit is then transferred at GA 30 days for echocardiographic and ultrasound evaluation. The rabbit is placed on a warming pad for the duration of the examination. Induction anesthesia is achieved by administering ketamine 35 mg/kg (Ceva Sante Animale, Brussels, Belgium) and xylazine 5 mg/kg (Ceva Sante Animale, Brussels, Belgium) intramuscularly. Once sedate, obtain intravenous access using a 24 Gauge cannula (BD Insyte-W, Becton Dickinson Infusion Therapy Systems, Utah, USA) inserted into a peripheral auricular vein. Maintain anesthesia with a continuous infusion of ketamine and xylazine: 2 ml ketamine (100 mg/ml) and 1.5 ml xylazine (20 mg/ml) to 46.5 ml of normal saline, then infused via a syringe pump at 40 ml/hr. Secure a three-way-tap and attach a 5 ml syringe of rescue anesthesia: 2 ml ketamine (100 mg/ml) and 1.5 ml xylazine (20 mg/ml). Boluses of 0.5 ml rescue anesthesia are rarely required. Administer analgesic buprenorphine 0.03 mg/kg (Temgesic; Schering-Plough) subcutaneouslyprior to surgery. Oxygen 2 L/min is applied by mask. Place a pulse oximeter (Nellcor N-20, Covidien, Ireland) on the maternal second and third toe to continuously monitor heart rate and arterial O2 saturation. Abdominal laparotomy and uterine exteriorization. Refer to 1.3.3 and 1.3.4. Fetal positioning for echocardiographic and ultrasound examination. Place the rabbit in a lateral position facing towards the researcher. This facilitates easier retrieval of a single gestational sac for examination and prevents excessive traction on uteroplacental vessels. As much as possible, try to exteriorize only one gestational sac at a time to minimize exposure. Ensure the exposed gestational sac is placed on gauze irrigated with warmed saline. To ensure standardized results between different study groups, generally only the fetus at the ovarian and vaginal ends of each uterine horn are used in the ultrasound examination. Fetal cardiac function is very susceptible to the effect of uterine exteriorization, change in temperature and pressure from the ultrasound transducer over the placental vessels. To minimize these environmental and iatrogenic confounding effects on cardiac function, the ultrasound examination must begin immediately after exteriorization of the gestational sac and should be systematic and efficient. In our experience, changes in fetal cardiac function seldom occur in the first 5 min of exposure. If fetal bradycardia is encountered, remove the ultrasound probe, reposition the fetus to prevent kinking of fetoplacental vessels, irrigate with warmed saline or briefly return the gestational sac back into the maternal abdomen. If fetal bradycardia is persistent, the examination for this fetus should be abandoned in favor of examining the next fetus. Flow velocity waveforms (FVW) of the umbilical artery are obtained by locating the umbilical vessels using color Doppler and then placing the pulsed Doppler sample gate over the umbilical artery on a free loop of umbilical cord.25 The middle cerebral artery (MCA) FVW is located by placing the pulsed Doppler sample gate just beyond the origin of MCA once the Circle of Willis is located by color Doppler.26 The ductus venosus (DV) FVW is obtained by placing the pulsed Doppler sample gate at the proximal portion of the DV seen with color Doppler where it originates from the intrahepatic umbilical vein either in a sagittal or transverse view of the fetus.26 The pulsatility index (PI) is calculated offline using the VisualSonics cardiovascular analysis software. 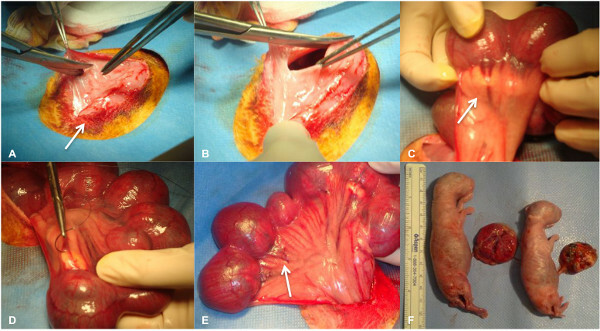 An asymmetrical growth restricted fetus and placenta from uteroplacental vascular ligation is compared to a normal control fetus and placenta in Figure 1F. Asymmetrical growth is confirmed by reduced neonatal birth weight and increased head circumference:abdominal circumference ratio to controls. Representative results from fetoplacental Doppler studies are shown in Figure 2. A normal low resistance pattern of positive end-diastolic flow in a control fetus is shown. With progressive increases in placental resistance seen in IUGR fetuses, absence and then reversed end diastolic flow is apparent. Figure 3 demonstrates a normal high resistance middle cerebral artery Doppler signal in a healthy fetus and a positive a wave ductus venosus in the same fetus. 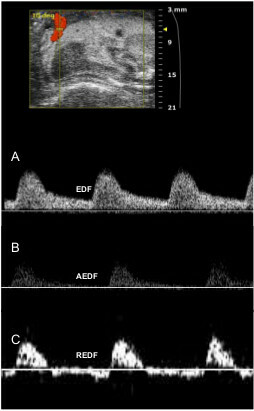 In IUGR fetuses, an increased pulsatility index of the ductus venosus and reversal of the a wave can be seen.14 Representative results from M-mode fetal echocardiography are then shown in Figure 4. This lateral view allows calculation of internal ventricular diameters and volumes. The apical view allows calculation of TAPSE and MAPSE. Figure 5 demonstrates speckle tracking of velocity vectors and the resultant regional strain curves to calculate strain, strain rate, displacement and velocity. Figure 1. Surgical technique of creating IUGR in a rabbit model. A: Midline laparotomy exposing rectus sheath, arrow = mammory glands; B: Safe entry into the abdominal cavity; C: arrow = uteroplacental vessels supplying gestational sac; D: suture method; E: arrow = completed ligation of uteroplacental vessel; F: representative control and IUGR fetus and placenta. Figure 2. Doppler ultrasound of the umbilical artery. A: positive end-diastolic flow (EDF); B: absent end-diastolic flow (AEDF); C: Reversed end-diastolic flow (REDF). Figure 3. A: Doppler ultrasound of the ductus venosus, s = s wave (ventricular systolic contraction), d = d wave (early ventricular diastole), a = a wave (atrial contraction); B: Doppler ultrasound of the middle cerebral artery. Figure 4. M mode echocardiography. A: lateral four-chamber view, LVID = left ventricular internal diameter, IVSD = intraventricular septal diameter, RVID = right ventricular septal diameter, ESD = end systolic diameter, EDD = end diastolic diameter; B: apical view demonstrating tricuspid annular plane systolic excursion (TAPSE); C: apical view demonstrating mitral annular plane systolic excursion (MAPSE). Figure 5. Fetal cardiac strain analysis. A: Region of interest defined by endo- and epi-cardium of the left ventricle; B: Strain rate curves of six myocardial segments, SR = peak systolic strain rate; C: Strain curves of six myocardial segments, Str = peak systolic strain. Cardiac motion depicted by M mode demonstrating end diastole (ED) and end systole (ES). Click here to view larger figure. We have used a previously validated approach of surgically reducing uteroplacental blood flow in a rabbit to produce IUGR13-16 and later examining fetal cardiac function14 to describe microultrasound technology and cardiac function analysis available on the VisualSonics VEVO 2100. The ability to reproduce fetoplacental Doppler changes of human IUGR fetuses in a small animal model and to then allow examination of cardiac function with recently described echocardiography is likely to progress fetal cardiac research in a clinically relevant way. In this model, if UA AREDF is observed the researcher can be confident that the primary surgery was successful in producing severe placental insufficiency and that further echocardiographic assessment is likely to be fruitful. Fetal echocardiography has recently branched out from a predominantly diagnostic domain of congenital abnormalities to now providing detailed functional assessments of cardiac function.18 Both Doppler and M-mode can be used to assess fetal ventricular function and derive measures of cardiac output.32 More recently, novel indices of cardiac performance in the fetus have been described such as speckle tracking and strain measurement33, the myocardial performance index24,34, tissue Doppler35 and three-dimensional (3D) techniques.32 An important feature of this current study is that these recent advances can also be performed on this small-scale rabbit model using the Visualsonics VEVO 2100 microultrasound and cardiac function analysis software. Furthermore, as previously described14 this model also allows assessment of the fetal hemodynamic response in other vascular territories, in particular the middle cerebral artery, ductus venosus and aortic isthmus, which are used widely in clinical practice when examining the growth-restricted fetus.36 Similarly, the effects of administering glucocorticoids in preparation for preterm birth may also be examined.37,38 This rabbit model offers further advantages in terms of internal controls in the opposite horn of the uterus, a similar villous and hemochorial placentation to human pregnancy13, low cost, availability and relatively easy handling. There are, nevertheless, several limitations of this model that must be addressed. The major limitation is iatrogenic fetal bradycardia during echocardiography. Maternally administered inhalational isoflurane can result in fetal bradycardia39 and should be kept to a minimum or as in our case not used at all during echocardiography. Instead, we substituted this for an intravenous infusion of ketamine and xylazine, which has recently been shown in rabbits not to alter mean arterial pressure40, thereby presumably maintaining placental (and thus fetal) perfusion. Despite this approach, exposure of the gestational sac to the external environment, handling and pressure from the ultrasound transducer can all cause fetal bradycardia temporarily. We describe in the method ways to minimize this effect, however for accurate results we believe echocardiographic and fetoplacental Doppler ultrasounds are best limited to around 5 min of total exposure. With increasingly complex echocardiographic techniques and learning curves now described in the clinical literature41, meticulous planning is required beforehand to ensure standardized results. Several of the echocardiographic measurements described in this study, for example valvular annular plane systolic excursion and speckle tracking with strain analysis, are not established in current obstetric clinical practice, despite their use in adult cardiology.42,43 Nevertheless, given the recent research interest in these novel measurements in fetal medicine, we chose to include them in our methodology to inform researchers that they are feasible to obtain when using this rabbit model. The analysis of these specific parameters in IUGR fetuses is beyond the scope of this methodological study. Another limitation relates to the natural tendency in the rabbit for IUGR based on fetal position44, therefore the well-perfused ovarian and vaginal ends of each horn are recommended for fetal case allocation. Furthermore, in this methodology, a gestational age of 25 days is used to surgically induce IUGR. This is based on previously described successful experiments, however the expected mortality rate is 50%.13,14 Lastly, the fetal size precludes chronic instrumentation that is useful in sheep models for the placement of hemodynamic flow probes for later non-euthanized measurements and repeated blood sampling.11 In conclusion, selective ligature of the uteroplacental vessels to produce IUGR in the rabbit with subsequent microultrasound examination of cardiac function represents an animal model that is consistent with contemporary clinical practice and therefore useful to bidirectional translational researchers. The author Professor Jan D'hooge has a research agreement with VisualSonics. The remaining authors have no disclosures. This work is supported by a Hamilton-Fairley NHMRC Fellowship (RH, AL); the Victorian Government's Operational Infrastructure Support Program (RH, EW) and the Marie Curie Industria-Academia Partnership and Pathways grant sponsored by the European Commission (ME, PD). The authors would like to thank Dr. Andre Miyague, Dr. Francesca Russo, Ms. Rosita Kinnart and Mr. Ivan Laermans for their technical expertise in producing this video. Bukowski, R. Stillbirth and fetal growth restriction. Clin. Obstet. Gynecol. 53, (3), 673-680 (2010). American College of Obstetricians and Gynecologists. Intrauterine growth restriction. ACOG practice bulletin no. 12. 12, American College of Obstetricians and Gynecologists. Washington, DC. (2000). Crispi, F., Bijnens, B., et al. Fetal growth restriction results in remodeled and less efficient hearts in children. Circulation. 121, (22), 2427-2436 (2010). Cosmi, E., Visentin, S., Fanelli, T., Mautone, A. J., Zanardo, V. Aortic intima media thickness in fetuses and children with intrauterine growth restriction. Obstet. Gynecol. 114, (5), 1109-1114 (2009). Ojeda, N. B., Grigore, D., Alexander, B. T. Intrauterine growth restriction: fetal programming of hypertension and kidney disease. Adv. Chronic Kidney Dis. 15, (2), 101-106 (2008). Stocker, C. J., Arch, J. R., Cawthorne, M. A. Fetal origins of insulin resistance and obesity. Proc. Nutr. Soc. 64, (2), 143-151 (2005). Barker, D. J. Intrauterine programming of coronary heart disease and stroke. Acta Paediatr. Suppl. 423, 178-182 (1997). Anthony, R. V., Scheaffer, A. N., Wright, C. D., Regnault, T. R. Ruminant models of prenatal growth restriction. Reprod. Suppl. 61, 183-194 (2003). Woods, L. L., Weeks, D. A., Rasch, R. Programming of adult blood pressure by maternal protein restriction: role of nephrogenesis. Kidney Int. 65, (4), 1339-1348 (2004). Turner, A. J., Trudinger, B. J. A modification of the uterine artery restriction technique in the guinea pig fetus produces asymmetrical ultrasound growth. Placenta. 30, (3), 236-2340 (2009). Miller, S. L., Supramaniam, V. G., Jenkin, G., Walker, D., W,, Wallace, E. M. Cardiovascular responses to maternal betamethasone administration in the intrauterine growth-restricted ovine fetus. Am. J. Obstet. Gynecol. 201, (6), 613.e1-613.e8 (2009). Barry, J. S., Rozance, P. J., Anthony, R. V. An animal model of placental insufficiency-induced intrauterine growth restriction. Semin. Perinatol. 32, (3), 225-2230 (2008). Eixarch, E., Figueras, F., et al. An experimental model of fetal growth restriction based on selective ligature of uteroplacental vessels in the pregnant rabbit. Fetal Diagn. Ther. 26, (4), 203-211 (2009). Eixarch, E., Hernandez-Andrade, E., et al. Impact on fetal mortality and cardiovascular Doppler of selective ligature of uteroplacental vessels compared with undernutrition in a rabbit model of intrauterine growth restriction. Placenta. 32, (4), 304-309 (2011). Eixarch, E., Batalle, D., et al. Neonatal neurobehavior and diffusion MRI changes in brain reorganization due to intrauterine growth restriction in a rabbit model. PLoS One. 7, (2), e31497 (2012). Figueroa, H., Lozano, M., et al. Intrauterine growth restriction modifies the normal gene expression in kidney from rabbit fetuses. Early Hum. Dev. (2012). Alfirevic, Z., Stampalija, T., Gyte, G. M. Fetal and umbilical Doppler ultrasound in high-risk pregnancies. Cochrane Database Syst. Rev. (1), CD007529 (2010). Baschat, A. A. Examination of the fetal cardiovascular system. Semin. Fetal Neonatal. Med. 16, (1), 2-12 (2011). GraphPad QuickCalcs: Random number calculators [Internet]. GraphPad Software, Inc. Available from: http://graphpad.com/quickcalcs/randMenu/ (2012). Rychik, J., Ayres, N., et al. American Society of Echocardiography guidelines and standards for performance of the fetal echocardiogram. J. Am. Soc. Echocardiogr. 17, (7), 803-810 (2004). Gnyawali, S. C., Roy, S., Driggs, J., Khanna, S., Ryan, T., Sen, C. K. High-frequency high-resolution echocardiography: first evidence on non-invasive repeated measure of myocardial strain, contractility, and mitral regurgitation in the ischemia-reperfused murine heart. J. Vis. Exp. (41), e1781 (2010). Forfia, P. R., Fisher, M. R., et al. Tricuspid annular displacement predicts survival in pulmonary hypertension. Am J Respir Crit Care Med. 174, (9), 1034-1041 (2006). Matos, J., Kronzon, I., Panagopoulos, G., Perk, G. Mitral annular plane systolic excursion as a surrogate for left ventricular ejection fraction. J. Am. Soc. Echocardiogr. 25, (9), 969-974 (2012). Cruz-Martinez, R., Figueras, F., et al. Normal reference ranges from 11 to 41 weeks' gestation of fetal left modified myocardial performance index by conventional Doppler with the use of stringent criteria for delimitation of the time periods. Fetal Diagn. Ther. 32, (1-2), 79-86 (2012). Edwards, A., Baker, L. S., Wallace, E. M. Changes in umbilical artery flow velocity waveforms following maternal administration of betamethasone. Placenta. 24, (1), 12-16 (2003). Edwards, A., Baker, L. S., Wallace, E. M. Changes in fetoplacental vessel flow velocity waveforms following maternal administration of betamethasone. Ultrasound Obstet. Gynecol. 20, (3), 240-244 (2002). Neitzke, U., Harder, T., et al. Intrauterine growth restriction in a rodent model and developmental programming of the metabolic syndrome: a critical appraisal of the experimental evidence. Placenta. 29, (3), 246-254 (2008). Neitzke, U., Harder, T., Plagemann, A. Intrauterine growth restriction and developmental programming of the metabolic syndrome: a critical appraisal. Microcirculation. 18, (4), 304-311 (2011). Maulik, D., Mundy, D., Heitmann, E. Evidence-based approach to umbilical artery Doppler fetal surveillance in high-risk pregnancies: an update. Clin. Obstet. Gynecol. 53, (4), 869-878 (2010). Morrow, R. J., Adamson, S. L., Bull, S. B., Ritchie, J. W. Effect of placental embolization on the umbilical arterial velocity waveform in fetal sheep. Am. J. Obstet. Gynecol. 161, (4), 055-60 (1989). Kingdom, J. C., Burrell, S. J., Kaufmann, P. Pathology and clinical implications of abnormal umbilical artery Doppler waveforms. Ultrasound Obstet. Gynecol. 9, (4), 271-286 (1997). Van Mieghem, T., DeKoninck, P., Steenhaut, P., Deprest, J. Methods for prenatal assessment of fetal cardiac function. Prenat. Diagn. 29, (13), 1193-1203 (2009). Van Mieghem, T., Giusca, S., et al. Prospective assessment of fetal cardiac function with speckle tracking in healthy fetuses and recipient fetuses of twin-to-twin transfusion syndrome. J. Am. Soc. Echocardiogr. 23, (3), 301-308 (2010). Cruz-Martinez, R., Figueras, F., Hernandez-Andrade, E., Oros, D., Gratacos, E. Changes in myocardial performance index and aortic isthmus and ductus venosus Doppler in term, small-for-gestational age fetuses with normal umbilical artery pulsatility index. Ultrasound Obstet. Gynecol. 38, (4), 400-405 (2011). Comas, M., Crispi, F., Cruz-Martinez, R., Figueras, F., Gratacos, E. Tissue Doppler echocardiographic markers of cardiac dysfunction in small-for-gestational age fetuses. Am. J. Obstet. Gynecol. 205, (1), 57.e1-57.e6 (2011). Baschat, A. A. Venous Doppler evaluation of the growth-restricted fetus. Clin. Perinatol. 38, (1), 103-112 (2011). Hodges, R. J., Wallace, E. M. Mending a growth-restricted fetal heart: should we use glucocorticoids? J. Matern. Fetal Neonatal. Med. (2012). Miller, S. L., Chai, M., et al. The effects of maternal betamethasone administration on the intrauterine growth-restricted fetus. Endocrinology. 148, (3), 1288-1295 (2007). Palahniuk, R. J., Shnider, S. M. Maternal and fetal cardiovascular and acid-base changes during halothane and isoflurane anesthesia in the pregnant ewe. Anesthesiology. 41, (5), 462-472 (1974). Baumgartner, C., Bollerhey, M., Ebner, J., Laacke-Singer, L., Schuster, T., Erhardt, W. Effects of ketamine-xylazine intravenous bolus injection on cardiovascular function in rabbits. Can. J. Vet. Res. 74, (3), 200-208 (2010). Cruz-Martinez, R., Figueras, F., et al. Learning curve for Doppler measurement of fetal modified myocardial performance index. Ultrasound Obstet. Gynecol. 37, (2), 158-162 (2011). Germanakis, I., Gardiner, H. Assessment of fetal myocardial deformation using speckle tracking techniques. Fetal Diagn. Ther. 32, (1-2), 39-46 (2012). D'hooge, J., Heimdal, A. Regional strain and strain rate measurements by cardiac ultrasound: principles, implementation and limitations. Eur. J. Echocardiogr. 1, (3), 154-170 (2000). Flake, A. W., Villa, R. L., Adzick, N. S., Harrison, M. R. Transamniotic fetal feeding. II. A model of intrauterine growth retardation using the relationship of "natural runting" to uterine position. J. Pediatr. Surg. 22, (9), 816-819 (1987).